Second Harvest Asia (2HA) Chair Charles McJilton has been in Manila since Nov. 13, and he reported about what he saw and heard when he talked to Philippine Red Cross and Department of Social Welfare and Development (DSWD). 2HA is planning to send food and water from outside the country to the affected through the two agencies, and we will take action based on the information we collect in the Philippines. Nov. 14 a.m.: Visited DSWD’s NROC (National Resource Operations Center) near Manila International Airport. DSWD gave the green light for donations and instructions on where they can be sent. At NROC met representative from International Rescue Committee. This is their first time to operate in the Philippines and they plan to bring in sanitation equipment. Also at NROC met the representative for the Philippine Air Force. Asked for a seat on the next C-130 heading to Tacloban, but President put out an order saying only DSWD people allowed to fly. Asked us to check with the US Marines. These care sacks are then put in larger sacks of four to six families. Four-family sacks can weigh 30kg and six-family weigh more than 40kg. They put a peso value on these larger sacks and I saw P342.19 written on the four-family sack. When we helped move these sacks I estimated there must have been 5k – 8k sacks mixed together in a large mountain. Our work was separating the four-family and six-family sacks and putting them on pallets. In spite of being a “national operations center” they only had one pallet-jack to move pallets and one forklift to put loaded pallets on trucks. This created a huge logjam in getting loaded pallets moved onto trucks. At NROC there were approximately 200 ~ 300 volunteers. Almost all were in some kind of group such as Bureau of Fire Protection (fire dept. ), Coast Guard, and many schools and companies. There were far more volunteers than actual work to be done. At a nearby location another packaging line was to be created. However, at 11:00 there were at least 200 volunteers, rice, and sardines but no plastic bags to bag rice or other items for the care sacks. Cris estimated that the line would not begin packaging until after 15:00. 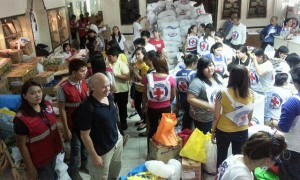 Nov. 14 p.m.: We visited Philippine Red Cross headquarters. Their first floor was filled with volunteers making their own packages similar to DSWD. Criticism that the government has acted too slowly and that aid is not getting out to those in need. Common refrain: Who is in charge? What is the plan? National and local government structures make responding to disasters like this extremely challenging. Power was devolved to the local governing unit (LGU) which seems good in theory. However, when those affected by disaster cannot carry out their responsibilities in the LGU, then there is a breakdown. Apparently the armed forces and police are prevented from distributing aid. Aid distribution is relegated to the LGU. However, this creates a whole different set of problems such as favoritism and power-imbalance. Aid groups in Tacloban are present but the aid is not. There is concern about safety in the area. How much is real and how much is just people stressed from the trauma of disaster is hard to say. TV shows police responding to reports of gunmen entering the city only to find local people at a bus stop. Looting is still a concern in many areas with storehouses ransacked for food. There is a sense that no one is in charge and that there is a growing politicization of the aid relief. Senators, government officials and even Red Cross all seem to be vying for the appearance of doing something that others are not. The national government seems powerless to make sweeping actions or lay out a longer range disaster response. Even the talk of where tent cities are going to be created hardly came up in my discussions today. Yet, a top DSWD official said that upwards to 10 million were affected and many might need some temporary shelter. The decision on where tent cities will be created will come from the LGU. However, this raises a good question of which LGU will decide. Will it be the one where the affected residents came from or the new geographical location, which in one case was reported to be 4 hours outside of Tacloban. Find a route to the disaster area, preferably Tacloban. Get information on where tent cities are being formed. This is where we can provide long-term support.